The VGD-100+ Internal Variable Frequency Drive is offered with smartphone companion app. The mobile app allows user to set-up, monitor status and troubleshoot. The product comes with four digital inputs, two digital outputs, BACnet and Modbus communications. The mobile app eliminates the need to access controls directly on the drive and enables the operator to monitor the status of multiple fans, adjust speed and settings when required. 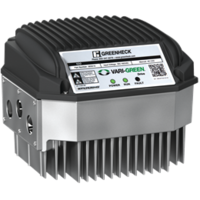 Greenheck’s latest addition to its line of Vari-Green® energy control products is the VGD-100+ internal variable frequency drive. The VGD-100+ is equipped with Bluetooth communications and a smartphone companion app that makes set-up, status monitoring and troubleshooting easy and intuitive. The app replaces the need to access controls directly on the drive while providing an easier to understand display. Users can monitor the status of multiple fans, adjusting speed and settings as required when used according to app specifications. The VGD-100+ also adds four digital inputs, two digital outputs, BACnet and Modbus communications to meet the needs of today’s demanding applications. The factory-mounted Vari-Green drive greatly reduces the cost of installation, wiring and commissioning. For more information, contact Greenheck, P.O. Box 410, Schofield, WI 54476-0410, (715) 359-6171, FAX (715) 355-2399 or visit www.greenheck.com.